Help distribute the treatment for a terrible disease. Phaer — Discover the secret of the plague-ridden town. The town of Phaer is beset by a mysterious plague. 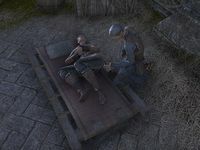 The town alchemist, Hendil, has taken steps to treat the ill.
(Optional) Talk to Anganirne, Endaraste, Aninwe or Ceborn. Collect salloweed west of town. Hand out the prepared salve, then return to Amuur. "Careful. Not safe in this part of Auridon." "Plague. Coin's the only reason I'm here. My crew is under contract." Who's in charge? Is anyone treating the sick? "The town alchemist has been tending the sick. In a local woman's barn, of all places. If you're determined to enter town, I won't stop you. "Make way, please. Whinnie and I are eager to be gone." "Plague. Stay away if you value your life. A dozen people afflicted over the last week." "Hendil has been tending to the ill in Aninwe's barn. He's just the town alchemist! No formal healer training. You want to risk your life? Be my guest. Whinnie and I are bound for Skywatch." "Hold up there, traveler. I'd head back the way you came if I were you." "Haven't seen you around here before. Probably want to make yourself scarce. Town's got a plague. Bad one." "Nobody knows. Started popping up in some of the kids, then spread. Soldiers aren't worth much around here. Don't expect a lot of help." "Yes, Hendil took over my barn. No formal healer training, but he's the best we have. If you're looking to help, Stars watch your steps." Hendil: "We're losing her, Amuur! Bring me that salve!" Amuur: "This is the last of the salve, sir. I hope it's enough." Hendil: "We can get more later. Hurry!" Hendil: "Yes, just like that. Apply the salve." Curorne: "Please. Don't let me die." Hendil: "She's alive. That's all that matters. Take her to quarantine." "Here about the plague? It's really catching on." "Sorry, sorry. This is about my fourth day without sleep. Are you feeling well? Can I help you?" I'm fine. How long has this plague been going on? "Uh, not long. My son was its first victim, bless his heart. I'm not really a healer, just the town alchemist. But I couldn't just sit by and watch people suffer." How do you treat something like this? "Salloweed aloe. It seems to hold back the illness for a time. I apply it to my patients as soon as they show symptoms. If their condition worsens, though, we put them in quarantine." "Actually, we just ran out of salloweed. A big patch grows just outside of town. Will you gather some? Amuur's already got the next batch of slave prepped. Just need the sap to get back to work." "Salloweed's pretty potent stuff. Gathering it should be safe enough. As long as you don't eat it, you'll be fine. I think." You mentioned a quarantine? Where is that? "Phaer used to be a mining town. The workings are still down there. After folks started to get sick, we wanted to keep the worst away from the uninfected. So we put them in quarantine down below." You just abandoned them to die? "No, not at all. Amuur and I go down regularly to care for them. We set up a contract with the mercenaries to keep everyone safe. This'll all turn out fine in the end." "Ah, you're back. Good. Sorry, just trying to stay on my feet." I've got some salloweed for you. "Wonderful. I'll have Amuur make up another batch of aloe straight away. I hope it wasn't any trouble for you?" Some people were wandering the fields. They looked diseased and attacked me. "Oh. They did? That's unfortunate. Very unfortunate." "Hmm? I'm sorry. My mind is drifting. Very tired. Some of the local farmworkers must have been touched by the plague. I'll send Amuur and some of the mercenaries to treat them. Thank you for telling me." "Yes, actually. If you could pass out the aloe to some of the villagers, I'll be able to send Amuur to treat those farmhands straight away. New patients popping up every day." "Let's see, have my list here. Nelulin, who should be out fixing the sheds about now. Eryeril, no doubt hiding in his home. And Aninwe. She owns this farm, probably just outside the barn here. Those are the next victims on the list." I'll pass out the aloe, then. Amuur: "I'll make the new batch right away, sir." Hendil: "Make this batch extra potent, Amuur." Amuur: "It's ready, sir. I put an extra dose in. Here you go." Hendil had you on his list. Said to give you some salve? "I'm sick? Stars. I suppose it was only a matter of time. it is my barn, after all." "Thank you! Here I thought my biggest problem was keeping the farm. Now I'm worried about catching the plague. The Stars move, I suppose." "What are you doing in my home? Don't you know who I am?" "It's about time! My family helped to found this Stars-forsaken town. You'd think I'd be one of the first to get treated." "You've done what you came to do. Get out. And don't dawdle. Bad enough I have to deal with these dirt farmers. Now I'm dealing with their diseases, too." "Sorry, help you? I've got a lot of work to do around here." Hendil sent me. I have some salve for you? "Salve? What? Does that mean I've got the plague? Stars above. Mother won't be able to bear this." I don't know. You were on his list. "Hendil's done so much for this town, all I can do is trust him. Wish this wasn't happening to me, though." "My mother, Velatosse. She's at her home nearby, waiting for word about my brother. He's down in the cave, waiting for Hendil to come up with a cure. It'll be all right. Thank you." Sorry to bear bad news. "Everything's going to be fine. We're just very worried about the poor victims in the mine. Does everyone have their salve? I spoke to all three of them. Are they ill? "In some cases I'm taking a preventative stance Hopefully that will stop the spread of the disease. The gods thank you. As do I." Once you have received your payment, Velatosse will whisper to you, "Psst! Over here!" she will have some interesting things to say. Hendil is using a barn near the edge of town as a hospice. If I'm going to help him out, I'll need to find him there. The alchemist Hendil uses salloweed sap to create a treatment, a salve. He's asked me to gather new supplies, as both he and his assistant are needed in the barn. 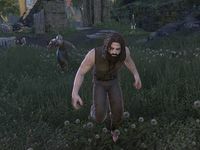 I gathered the salloweed for Hendil. I need to take it back to him at the makeshift hospital. I need to grab the salve from the workbench in Hendil's hospice. Hendil and Amuur are still very busy. The alchemist has asked me to deliver salve to three villagers of Phaer. Finishes quest I delivered the salve to the villagers of Phaer. I should report back to Hendil now. This page was last modified on 17 December 2018, at 23:58.